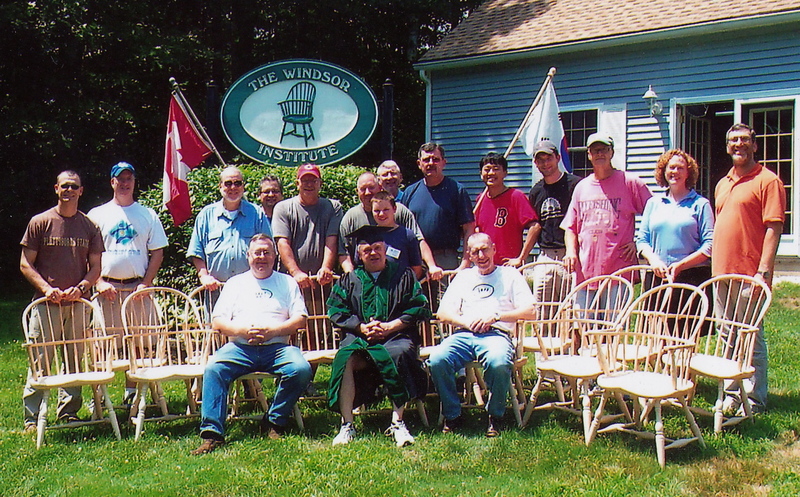 Going back to New Hampshire next month to make another Windsor chair with Mike Dunbar. I enjoyed the trip a couple of years ago and I really like the chair I made while I was there. And since my son moved to Connecticut last fall, I can drive about two hours to his house for a visit on the way back to Atlanta. 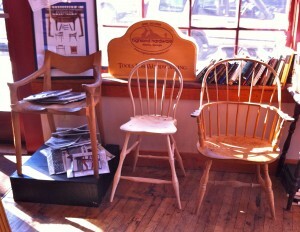 This time I am going to make a Philadelphia high back Windsor chair. Mike requires a sack back chair as a prerequisite to his other classes. Making the high back should be a challenge since last time the sack back took every bit of the full week we had scheduled. 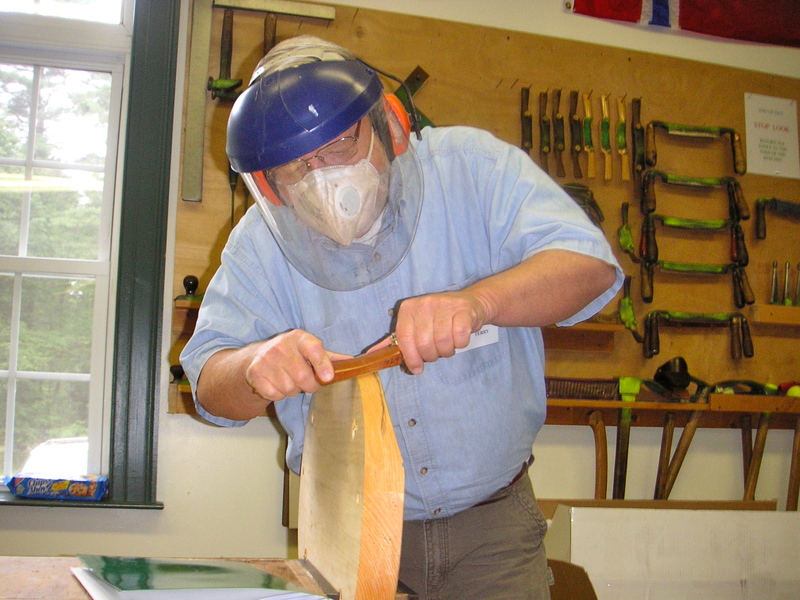 This time we have to get some stock and make seven spindles to specification ahead of the class. This will be my third Windsor, the last one being the child’s Windsor with Peter Galbert at a class at the High. It is still in the Store by the way — a highlight of my woodworking career. Go by and look at it next time you are at the Store. My name is on the bottom — they let me sign it. Maloof on the left, Dunbar on the right, and (dare I say it) Chapman/Galbert in the center. Making a chair with Mike is fun. His shop is beautiful and well equipped, but I think he may have missed the classes on education technique and psychology. I say that because he has a Wall of Shame at the top front corner of the shop. If you really screw up a piece of your chair, he nails it up on the wall and puts your name on it as a warning to future students. Kinda like you might put a fake owl in your garden to keep the crows away. Course on the other hand, if you see another way to do something he is willing to listen, as evidenced by the tools you can buy on his web site which are named after the student who suggested the new method or technique. Maybe he actually did have some of those classes. Spoke shaves are noisy, dusty and throw off lots of chips. Safety first!! and I have dealt with topographic contour maps my whole career. The shape of the seat of a chair is subtle and difficult and must be made by hand and if you have never seen one done right, it is not an easy task. Curtis has what is unabashedly a commercial on his web site. In fact, I laughed when he says at the beginning “This is a commercial and if you don’t want to see me sell you something, turn it off”. I like that. But anyway, he wanted a way to convey the subtle shape of the seat, so he made a seat blank of glued-up eighth inch thick plywood painted black, and then he carved the seat out of it same as he always does. The result is the edges of the plywood show up as black contour lines at a one eighth inch vertical spacing (contour interval for all you topo geeks) running all over the seat. I read it instantly and I love it. Go click on the video and look for the topo seat map at about 3:40. 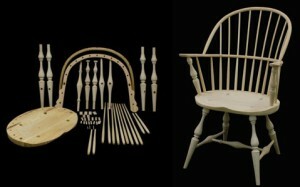 Chair Kit — Make your own! Then try the Windsor chair kit from the High and make one yourself at home. Look through the listings at all the chair tools, kits and plans we sell and pick one. You know that many say if you can make a chair, you can make anything! 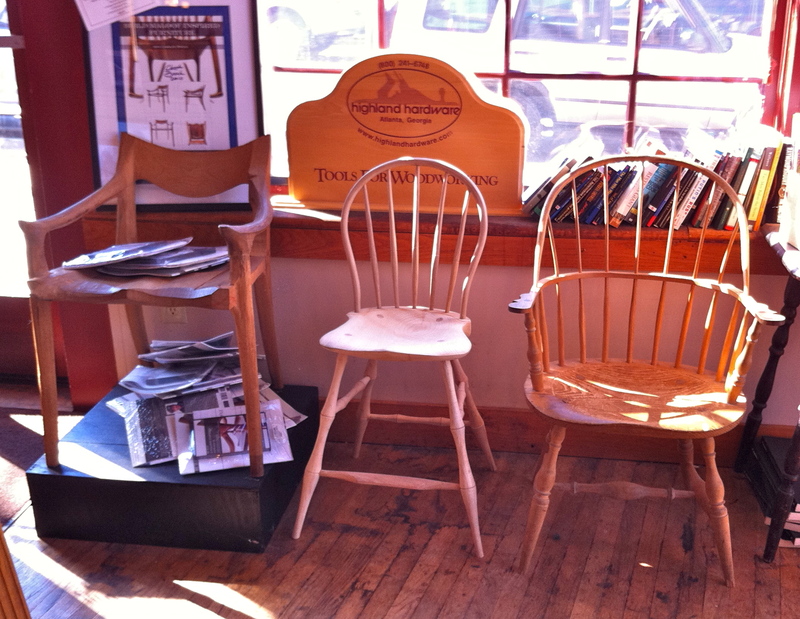 What kind of chair will you make? Terry, wish I could share the bench with you again this year but can’t make it up. I am closer though, we moved from TN back to Northen KY (greater Cincinnati). Be sure to post some pics. Terry- You’ve hit on all the guys I follow regarding Windsors! I just glanced at the picture in your post (didn’t enlarge) and as I read the article then Rick’s comments I was like, “Holy Cow, I was in that class! !” It was a blast and I, too, hope to get back to Hampton to take a C-Arm class. Enjoy your class!